Notes The Soviets also developed a range of anti-tank grenades which could be thrown by hand (Ruchnaya Protivotankovaya Granata), and the first of these was the RPG-40. The RPG-40 was a contact grenade which was only effective against light AFVs. It was powerful enough to penetrate around 20mm of armour up to 20mm, but the blast effect from the explosive could damaging light AFVs. Because of the damaging effect the RPG-40 was more effective in disabling a tank by blowing off tracks. 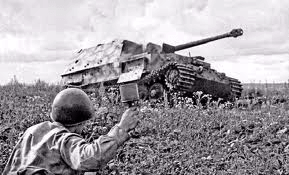 It was also useful in knocking out pillboxes and fortifications, but was found ineffective against German medium and heavy tanks. The RPG-43 used a shaped charge to penetrate enemy armour and this made it far more effective than the RPG-40. It was first issued in 1943 and eventually replaced the RPG-40 as standard anti-tank grenade. The RPG-6 was also a HEAT grenade and designed as a replacement for the RPG-43. It was found to penetrate up to 40mm more armour than the RPG-43 and was issued in large numbers.